When Shelby gets out of school for the summer, she's excited to spend time with her neighbors, Mr. and Mrs. Tucker. As her parents are both very busy doctors, Mr. and Mrs. T have "adopted" her as their grandchild and watch her when her parents are both working. Shelby feels that each moment with Mr. T is extra special since he went through cancer treatments the previous year. 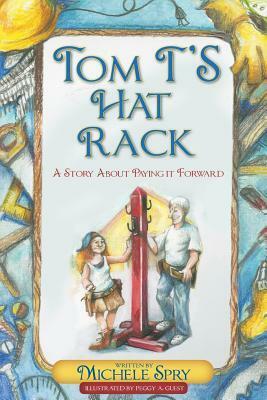 Tom T's Hat Rack by Michele Spry is a story that teaches the importance of paying it forward. Mr. T enlists Shelby's help at the beginning of the summer on a project, but he won't tell her what it is. She commits, and soon they are cutting and sanding and painting various pieces of wood. They work for several weeks, but Shelby doesn't realize until the end just how special the project really is. This is a sweet story that shows children how they can give back to their communities. I haven't read it with my kids yet, because I was concerned there would be too much sadness. There is not. This is a positive book in which the characters all remain healthy throughout (in case you were worried about the same). It's an excellent lesson packaged in a cute, engaging story, and I will definitely be reading it with my own children soon. If you have children and would like to teach them a bit about paying it forward, I highly recommend Tom T's Hat Rack. This review was written based on a copy of Tom T's Hat Rack that I received from the author in exchange for an honest review.